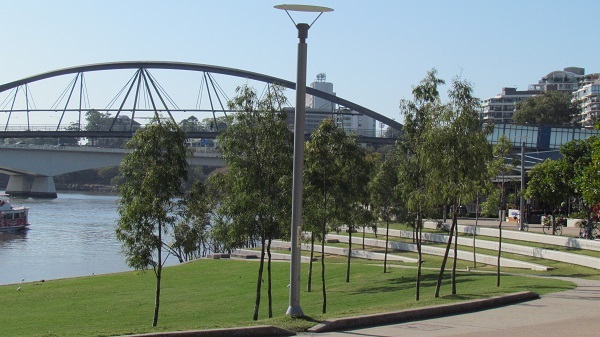 Is there anything better than a Brisbane Saturday spring morning? The sun is shining, the birds are twittering, a light breeze is blowing, the world seems at peace, and the prospect of a delightful weekend stretches in front of you. The only way to embellish this is to venture out into that sunshine for a leisurely breakfast by the river, which is exactly what Comedy Relief and I did this morning. 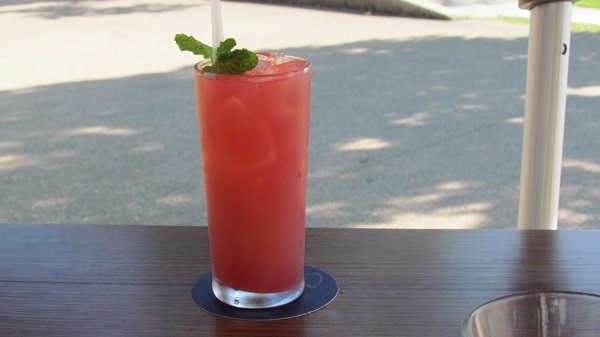 Our breakfast at Cove Bar and Dining really 'upped the ante' in our search for Saturday morning perfection. The view from Cove Bar and Dining. Photo taken by writer. 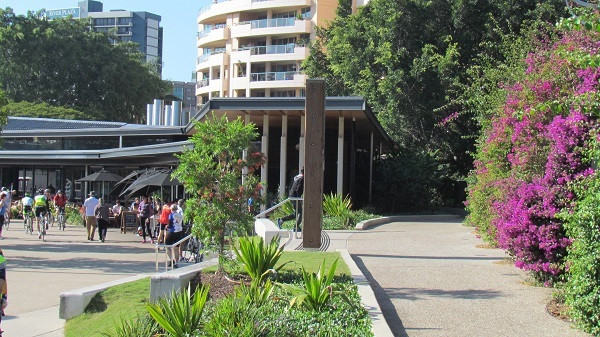 Nestled prettily but unobtrusively in South Bank's River Quay dining precinct, Cove Bar and Dining sits at the end of the row of restaurants, perched above a sweep of lawn and framed on one side by South Bank's famous magenta bougainvilleas. 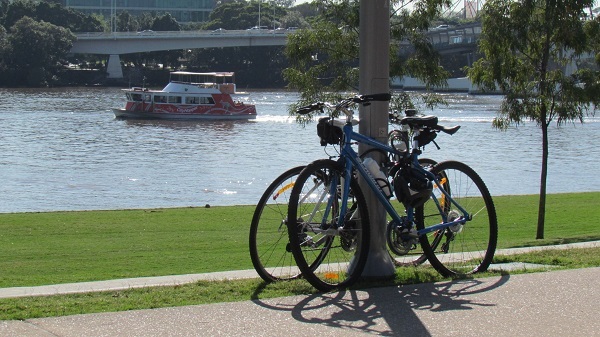 It presides over an uninterrupted view of the river and the gaggle of CityCats, ferries, rowers and dragon boats that ply this busy stretch of water. 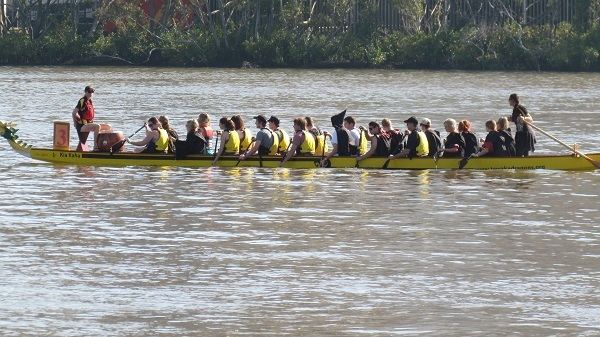 Dragon boat on Brisbane River. Photo taken by writer. The restaurant itself presents a stylish face to the river. Everything from the large black umbrellas tilted at just the right angle to keep out the sun rather than the views, to wait staff in crisp black-and-white-checked shirts and jeans, timber-lined walls, and the mix of wicker chairs and cheerful orange-striped bench seating, contributes to the casual, laissez-faire ambience that's so right for weekend breakfast or brunch. That's obviously why Cove Bar and Dining recently decided to add breakfast to their menu. 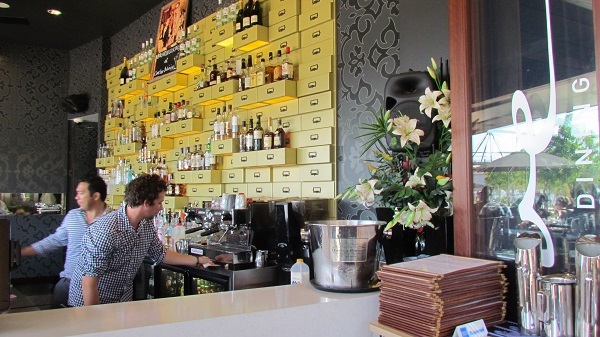 The wall behind the bar looks like an arrangement of old-fashioned filing boxes with drink bottles popping out of opened boxes - very clever. The quirky, clever bar. Photo taken by writer. On arrival our friendly waitress offered us a choice of indoor or outdoor dining, but who in their right mind could pass up the opportunity for a connection with this particular slice of the great outdoors? We were promptly settled at our table, provided with water and left to make our selections from the menu. Cove diners seated at the outdoor tables. Photo taken by writer. It's not an extensive menu, but the seven dishes looked mouth-wateringly tempting, with vegetarians and those with gluten intolerance catered for. 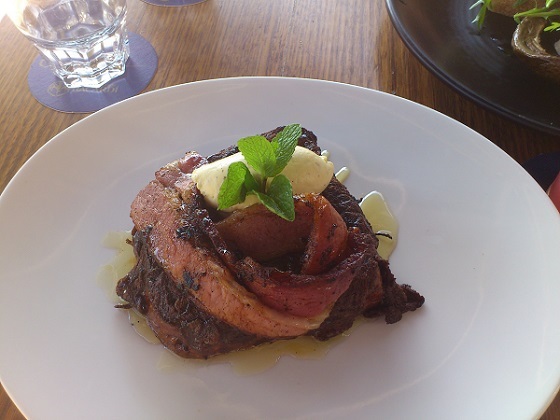 Eggs, as would be expected, featured strongly, with dishes like eggs Benedict and Coves "Big Breakfast", and other choices included oven baked muesli, coco brioche French toast and herbed cavolo nero frittata. There is also a wide variety of 'sides' that can be added to your order, including streaky bacon, field mushrooms, haloumi and chorizo. 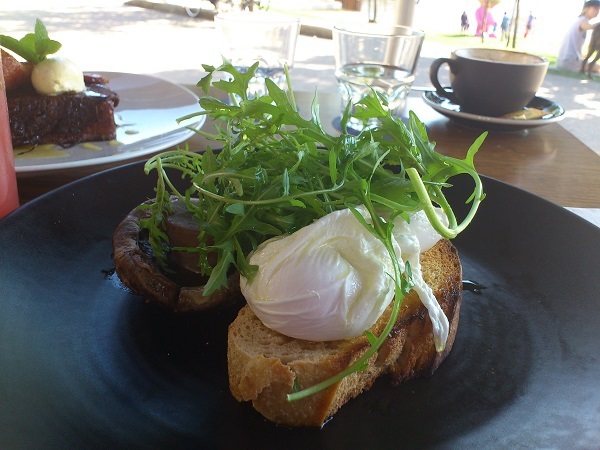 My sweet tooth couldn't go past the coco brioche French toast and streaky bacon with agave syrup and cinnamon powder, while Comedy Relief opted for the poached eggs with field mushroom and rocket on sour dough. Along with the delightful views and gorgeous sunshine a passing parade of people and canine traffic kept us entertained while we waited for our meals. We even had a laugh as we noticed the traffic beginning to back up on the Captain Cook Bridge across the river; such things are not the concern of carefree weekend breakfasters. Parked bicycles in front of Cove. Photo taken by writer. You'll see the whole gamut of cyclists, serious walkers, mums and dads pushing prams, tourists, and those out for a lazy stroll with the family pooch. The restaurant seemed to be a hot spot for lycra-clad customers breaking their free-wheeling wanders for a coffee, breakfast and well-deserved rest. In another restaurant we may have been tempted to just bask in the glory of the day and the surroundings but thankfully the quality of the food at Cove allowed us to bask in the food as well. Our selections arrived simultaneously (which is always a plus as far as I'm concerned) and were served with a smile. Delicious French toast. Photo taken by writer. I am a connoisseur of French toast and this was excellent; a soft cakey brioche about an inch thick, wearing a crisp, eggy, chocolatey skin, accompanied by a thick slice of bacon. The addition of cocoa brought a whole new depth to the flavours, and the dish was none the worse for the lack of maple syrup, a particular favourite of mine; agave syrup was a sweet replacement. Comedy Relief's perfectly poached eggs. Photo taken by writer. Comedy Relief's eggs were perfectly poached and served with bacon, a huge, tasty field mushroom, smothered in fresh rocket and atop a large slice of artisan-style sourdough toast. He had coffee to accompany his breakfast while I took some time to make a choice from the range of juices on offer. There's something about cranberry that just does it for me, and my selection of a 'Cove Breeze' - cloudy apple, pineapple, cranberry and a dash of lime - was the perfect blend of zesty refreshment and colourful but simple presentation, although a little pricey at $10 a glass. Tangy and refreshing Cove Breeze. Photo taken by writer. As we finished our last mouthfuls and leaned back in sated contentment, an obviously well-fed and happy dog trotted past in the way that dogs do - you know, all full of good-humoured appreciation of the world and their comfortable place in it, and at that moment I knew exactly how he felt. 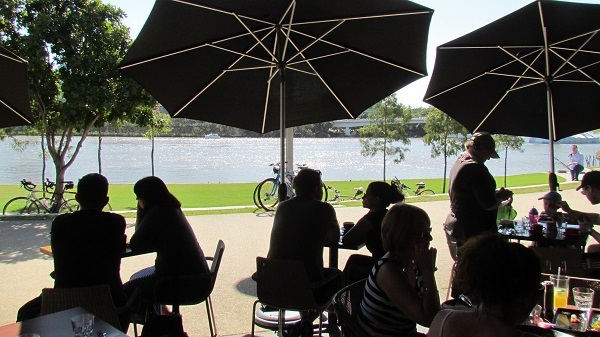 Brisbane, spring, Saturday morning, breakfast at Coves; it really doesn't get any better than this. Looking toward River Quay. Photo taken by writer. Coves Dining and Bar is open for breakfast from 8am on Saturdays and Sundays. See the website for their lunch and dinner opening hours and menus. Why? It's weekend perfection on a plate by the river. When: Open for breakfast on weekends from 8am. That brioche dish looks absolutely sinful. I want some. Great article Geraldine - I reckon that Cove Breeze looks very inviting myself.